Melanie Gouby: "Despite gnl consensus tht elections wouldn't be fair, Congolese came en mass & showed real enthusiasm to cast their vote"
Her Sweet Anger: "sick of repetitive #drc2011 elections headlines #violence #blood #corruption #fear. i know situation not perfect but still be a bit creative"
CongoSiasa, however, is less sanguine: "I emphasize that this is a huge country and in other areas voting has been happening peacefully. Nonetheless, this violence and persistent accusations of fraud are very troubling." So what happened today? So far, there has been only one report of electoral violence resulting in fatalities. Accounts differ on the details. Interior Minister Bikanga Kazadi told the Associated Press that gunmen attacked polling stations in Lubumbashi, killing one unidentified person. The army was called in to quell the attack, the minister said, and killed four of the assailants. Reuters indicated that Congolese security forces had detained a dozen suspects after masked gunmen using automatic weapons attacked a polling station. It quoted Moise Katumbi, the governor of Katanga "Three people were killed, seven were arrested and five handed themselves over after being surrounded by the army." A third account indicated that the gunmen had been preliminarily identified as a Mai Mai group seeking Katangan independence and that the incident took place near the Institut Njanja in Lubumbashi. Several people died in campaign-related violence in Kinshasa over the weekend, but today in the capital most voting seems to have proceeded calmly, albeit not always smoothly. The most notable hiccup came when Etienne Tshisekedi, the primary opposition figure, was temporarily prevented from making his way to the polling station in Limete, the leafy neighborhood in Kinshasa where he has lived for decades. He later made his way without incident. Violence elsewhere has been sporadic but not deadly. In Kananga, in Kasai Orientale, Tshisekedi's stronghold, fifteen poll stations were set on fire, and protesters attacked other stations with rocks. Most of these cases stemmed from frustration when polling stations failed to open on time or turned voters away. Elsewhere in the country, notably in Mbuji Mayi and the Kivus, violence seems to have been a spontaneous reaction to rumors of ballot stuffing or other fraudulent activity. It is hard to assess how accurate those rumors are, since there are less than 1,000 election monitors for some 63,000 polling stations. Cindy McCain told AP that she and her electoral observation team came upon a ballot box already a third full when they arrived at the polling station at dawn, but later told Al Jazeera that she was "really hopeful. What we've seen has not been perfect progress but a really good beginning." And al-Jazeera has footage allegedly demonstrating that many voting cards and ballots had been pre-marked in favor of Kabila. There have been a lot of technical screw-ups: Polling stations not located where they were supposed to be. Stations not opening on time. People arriving at stations to find they're not on voting rolls. Ballots missing. Ballot boxes and uniforms missing. Rain disrupting transport and clogging traffic. 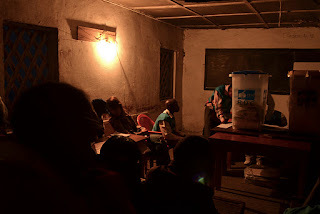 Electricity outages forcing people to vote in the dark. Chaotic monitoring programs, with observers from the various campaigns crowding out prospective voters. Long lines and waits. Parliamentary candidates numbered incorrectly on ballots. Inadequate provisions to deal with the many illiterate voters. 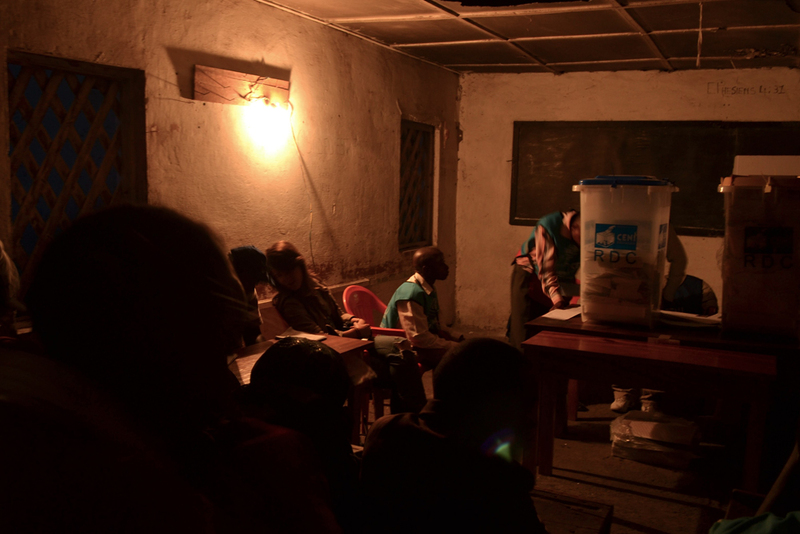 At this writing, 9:30 EST, it is not yet clear whether CENI, the Congo's electoral commission, will call for a second day of voting to make up for the first day's mishaps. None of this is particularly surprising. In fact, given the generalized disorder and semi-controlled chaos that is DRC, many observers think the election's gone off about as well as one could have expected. Up through the weekend, many observers didn't see how the country could resolve the massive logistical hurdles that remained and had called for a brief postponement in the election. In contrast to 2006, when the international community spent $400 million to organize Congo's election, it played only a small role in planning (or paying for) this one. So what to conclude? On the one hand, there have been no allegations of systemic violence or intimidation. This isn't Nigeria 2007 or Zimbabwe 2008. On the other hand, neither Kenya 2007 nor Cote d'Ivoire 2010 experienced serious violence on election day itself. It's the period immediately following the announcement of the results that is most worrisome. And on that count, the prognosis remains cloudy. Best way to follow hour-to-hour events is on Twitter #drc2011 or #drcelections. Laura Seay, in particular, deserves a call-out for being all over the coverage on this election.